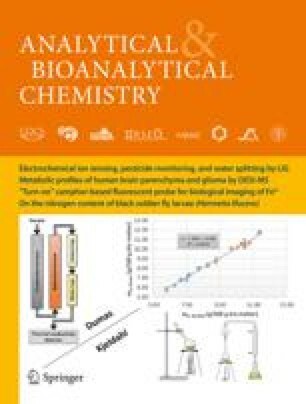 A high-performance liquid chromatography–inductively coupled plasma mass spectrometry (HPLC–ICP–MS) method is presented for analysis of cisplatin, monoaquacisplatin, diaquacisplatin, carboplatin, and oxaliplatin in biological and environmental samples. Chromatographic separation was achieved on pentafluorophenylpropyl-functionalized silica gel. For cisplatin, carboplatin, and oxaliplatin limits of detection of 0.09, 0.10, and 0.15 μg L−1, respectively, were calculated at m/z 194, using aqueous standard solutions. (3 μL injection volume). The method was utilized for model experiments studying the stability of carboplatin and oxaliplatin at different chloride concentrations simulating wastewater and surface water conditions. It was found that a high fraction of carboplatin is stable in ultrapure water and in solutions containing 1.5 mol L−1 Cl−, whereas oxaliplatin degradation was increased by increasing the chloride concentration. In order to support the assessment of oxaliplatin eco-toxicology, the method was tested for speciation of patient urine. The urine sample contained more than 17 different reaction products, which demonstrates the extensive biotransformation of the compound. In a second step of the study the method was successfully evaluated for monitoring cancerostatic platinum compounds in hospital waste water. Financial support was granted through the Austrian Science Fund (FWF-Project P16089-N03: “Speciation of cancerostatic Pt compounds in the environment”). Professor Robert Mader (Vienna University Hospital) is gratefully acknowledged for sampling of patient urine.